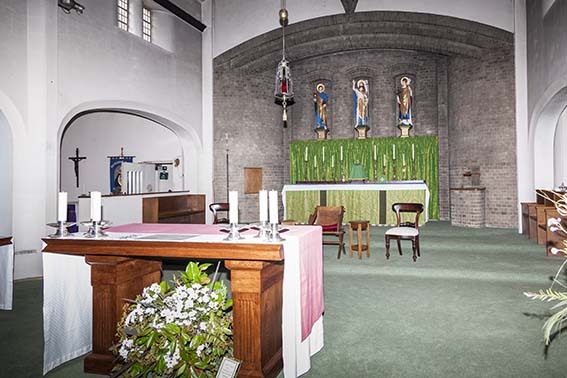 Originally a mission church in the parish of St Botolph Heene, but since 1955 the church of a separate parish, this was designed initially in 1900 by G J Hagger, whose practice had merged with that of G Cogswell by the time he returned to add a porch and chancel in 1913 (1 p211). 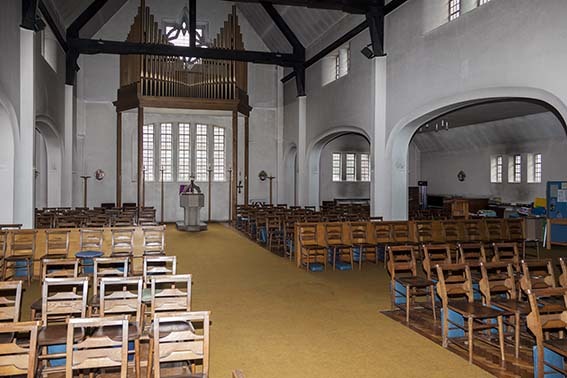 This church was adapted to form the south chapel of a larger one, designed by N F C Cachemaille-Day in 1936-37 (BAL Biog file). It was completed except the tower the following year at a cost of £8000 (CDG 18 p341). The overall dimensions and the unusually broad aisles of the extended church were determined by the low proportions of the original one (1 p211); the materials used are grey brick and flint. The plain trussed roof and the depressed four-centred arches of the arcades are a gesture to historicism not always found in Cachemaille-Day’s work. The low proportions are most obvious in the arcades, though the overall effect is unexpectedly spacious. The windows are less traditional in appearance, notably the star-shaped ones in the east and west gables of the nave. There is a lower east sanctuary which inside is faced in stone with an elliptical roof, but it has no east window; instead there are three niches containing painted figures behind the altar. The broad tower at the east end of the north aisle is also low, but though intended from the first, it was not built until 1964, when J E Jackson assisted Cachemaille-Day (WSRO Par 224/4/16). The spire that surmounts it is a broach with squat proportions reminiscent of many mediaeval ones in the Sussex downland. In 1966 Jackson alone built the south porch (ibid Par 224/4/17). In 1971 J L Denman altered the interior and moved the font (ibid Par 224/4/18). 1. 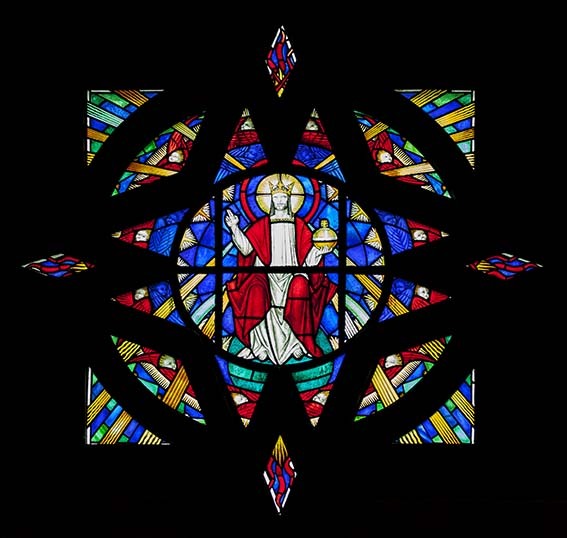 (Star-shaped window at the east end of the nave) C Webb, 1937 (1 p212). This is designed to exploit the shape of the window and uses exceptionally vivid colours. 2. (South chapel, east window) Barton, Kinder and Alderson, 1947 (WSRO Fac). Conventional figures in muted colours, set in plain quarries. Font: J Cribb, 1937 (1 ibid). Octagonal bowl. Lectern: J Cribb, c1937 (ibid). Other fittings: Unspecified ones by J Wippell and Co, c1937 (ibid). 1. (East niches inside) Painted and gilded. 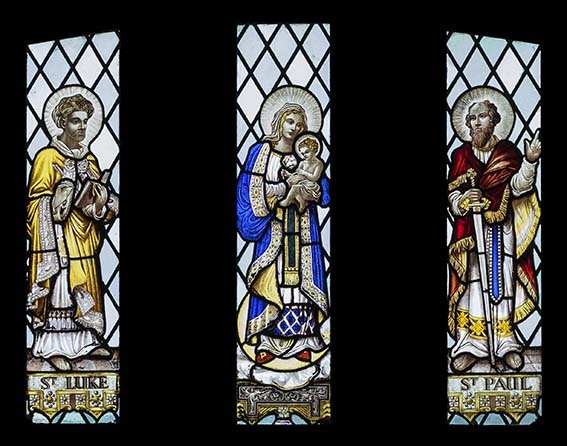 Christ, St John and St Richard. Designed by C Webb and made by A R Mowbray and Co, c1937 (ibid). 2. 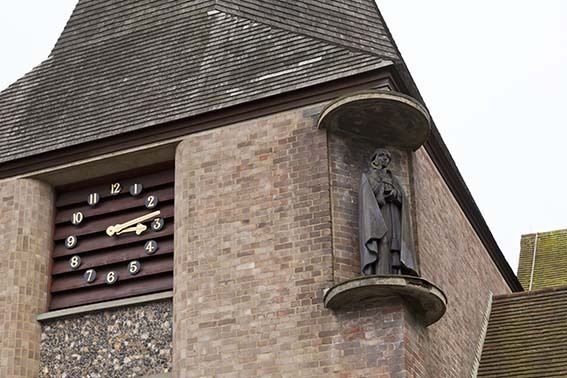 (Under a flat circular canopy on the angle of the exterior of the tower) St John by J Lawson (Elleray (2004) p57). It is carved in teak. 1. My thanks to Josie Campbell for the photograph of the exterior. 2. My thanks to Nick Wiseman for the remaining photographs.